Adopting a Podenco has changed the lives of many, bringing joy to households the world over. You can see a small selection of our happy pod owners and their stories on this page or on the Happy Days Ahead page and also follow their continued journey on our Facebook page Hope for Podencos - Happy Days Ahead and Instagram stories. 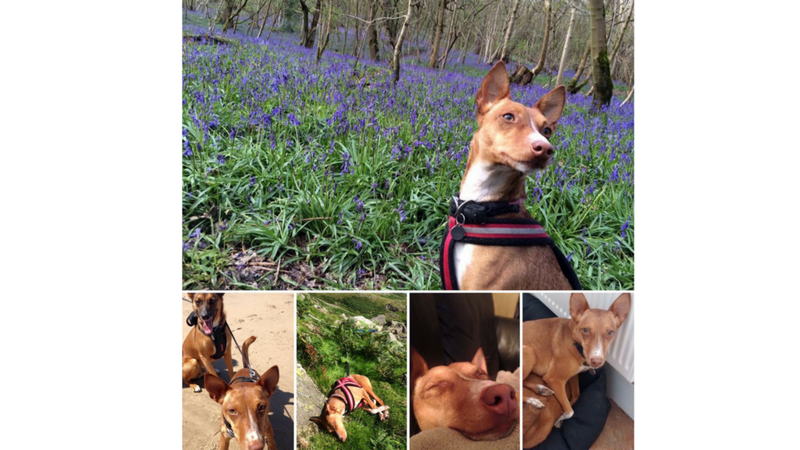 "I first started looking for a podenco to adopt in the spring of 2016. I wanted to find the best possible place to adopt from. I did not want to adopt a podenco who was much traumatised and in horrid, cramped living conditions because it would be my first! Then I happened to come across on Hope for Podencos. It seemed perfect! Only problem was that I didn’t know if they would adopt a pod to Finland? I contacted Irene and she answered yes, so the next step was to fill in an application. I did that, and in it I specified what kind of dog we were looking for. She found three for me to consider. After chatting about them I fell in love with Nevis. He came to Finland in mid-September 2016. I am so happy with every stage of the adoption. I feel I made the best decision with Irene’s help. I love staying in touch with Irene & Steve and should I have any questions about Nevis I know I can turn to her for advice. I trust her experience and I am in awe of her dedication". "I adopted my first dog, a Podenco cross in 2013 from some friends who brought him over from Spain. I immediately fell in love with the Podenco & thought it was time he had a friend. I spent a long time looking & as soon as I saw a photo of Zahra I knew she was the one. I contacted Irene expressing my interest in Zahra and she sent me over some information & a pre-adoption form. We then spoke over the phone and discussed Zahra & my life style to see if she would be suitable for us. Irene was amazing as I had so many questions, having not adopted a dog directly from Spain before I had a lot of questions. Irene then arranged all the transport. Zahra was such a small and nervous dog, Irene knew that the transport may be stressful for her so Irene made sure she fed her up and was kept warm during transport. Zahra arrived on our doorstep & we've never looked back. She's fitted in perfectly and grown in confidence and I can't thank Irene and Hope For Podencos enough, they saved her, fostered her and brought her a new life & into ours. Thank You"
Podenco Puppy Etorre was handed over to the shelter by a hunter. If he wouldn't have been rescued by us, he would have died of PARVO. Instead he is living the good life in Czech Republic. Within days he was doing canicross and loving it. Being the first from Czech Republic, Irene was quite hesitant at the begining, but I can never thank her enough for the leap of faith she finally decided to take. Etorre is one of a kind; very close to you yet very independent at the same. Irene's devotion and work running Hope of Podencos is admirable, having saved so many lives already, and yet many more to come!" "I am one of the many lucky adopters of two of Irene's Allen's Podencos. My name is Eda Holt and my husband and I live in Atlanta Georgia with our five Greyhounds and one galgo. I became extremely interested in podencos when seeing them on Facebook and fell madly in love with one in particular named Rogan. I followed his sad story from the kill shelter with a cracked pelvis to being in Irene's Care at her beautiful home. I had heard they were harder to handle then galgos but when I started speaking with Irene she told me exactly what his demeanour and personality was like. I then asked if I could adopt him and she told me yes. It was a very thrilling moment for me and my family. Only about 6 months later we adopted Ariana from Irene as well as a playmate for Rogan. Irene knows her dogs so well inside and out that everything she told us about each dog was precise and exactly right. She is always there for questions and always happy to see pictures of her dogs in a fun-loving home environment. My husband and I cannot say enough fabulous things about Irene, Steve, and Hope for Podencos. We have so fallen in love with the breed that we have discussed that that will probably be all we ever adopt from now on. Transport was amazing with caring people who kept us updated on every leg of the trip with photos and live streaming video coming constantly I can't say enough wonderful things about this entire group! I have two friends who have since adopted Podencos and feel the same way we do". "Lottie came into our lives only a few months ago, but has has made quite the impact! We have always been cat people but I (Clare) had started hankering for a dog a few years back and after an operation last November with a long recovery found myself wanting more, my cats are my world and I adore them but Lottie is my companion (Lee's alright too...). We approached Irene and Steve after hearing how amazing Podencos could be with cats, even with their reputation as a hunting breed. We wanted to adopt a rescue dog but had found it difficult finding anywhere that would come and visit us for a cat home check or would be willing to give us the support we felt we needed to do the introduction on our own. Neither of us had owned dogs ourselves so it had been a long time since we were children with pet dogs that were really cared for by our parents hahahahah. After a call with Irene I was comforted to understand more about the breed and the Pods she thought off the bat might be well suited to our home and lifestyle, in particular the cats. The process was in motion and we were delighted. We loved the pictures we were sent and instantly fell for Lottie, we were ecstatic to hear she had passed the thorough cat checks and test Irene and Steve carry out and of course messaged back to confirmed Lottie as ours straight away. When Lottie arrived after her long drive she was visibly nervous but eventually made it in to the house and sat with me, not too much coaxing from Steve required! I was hooked. Steve took the time and patience to sit with me and talk through the introduction and tips and tricks for making the integration a successful one. When we initiated the first meeting Lottie showed excitement but no signs of aggression which was a huge relief, he was finally free to leave us. As time has gone on and by sticking to Hope for Podencos's advice we now have a happy house with both cats and dog living in harmony. We may have been a little lucky as it only took a few weeks of care when the picture you see here was taken, but I have heard from many other Pod owners that they too have done this. Lottie is respectful of the cats, they are the boss's, but neither of our cats had lived with a dog before and neither are particularly bolshy so imagine how it could be done with more typical cats, easy peasy! Our next adventure is Canicross, using the dog to make me more healthy and conquer my need to give up smoking, its hilarious and should be tried by all, Lottie excels which I am told is typical of the breed and sighthounds in general. We thank you both for everything, you are an amazing charity and do great things for these beautiful, loving, funny dogs, our world has changed but only for the better!"